Last week, the 28 meter H.E.S.S II cherenkov telescope began operations for the first time. 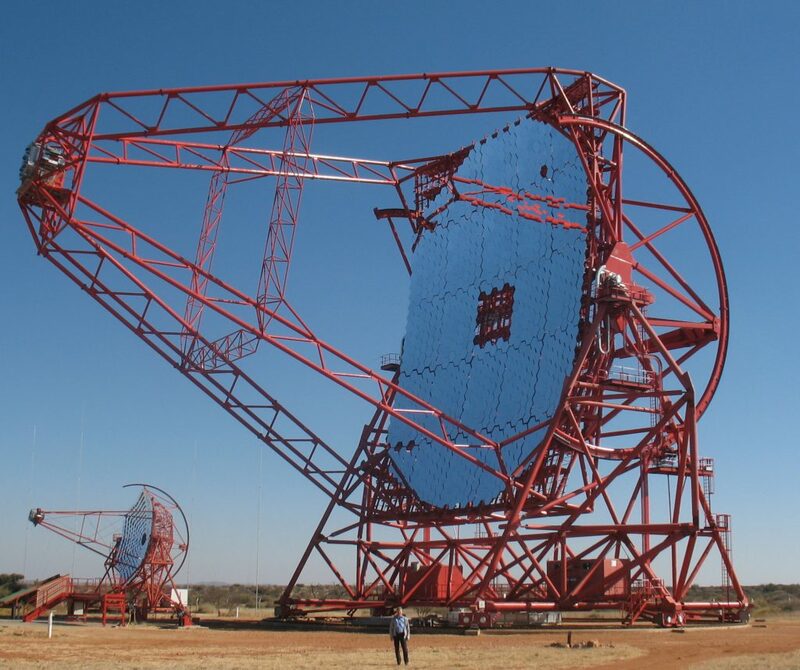 Built at the High Energy Stereoscopic System (HESS) observatory in Namibia, it is the largest telescope ever built which operates in the gamma ray spectrum. Gamma ray telescopes are tricky devices, as gamma radiation passes straight through any material that might be used as a focusing lens or mirror. Even when ways are found to defeat that obstacle, there’s still the problem of Earth’s atmosphere being opaque to gamma rays – gamma ray telescopes must be placed in orbit if they are to see anything. Cherenkov telescopes are an ingenious way past both problems. When high energy gamma ray photons strikes air molecules high up in the Earth’s atmosphere, the collisions can be more violent than in our biggest particle accelerators and result in a cascade of particles, which release their energy as visible light – a phenomenon known as Cherenkov radiation. Rather than trying to detect the gamma rays directly, a Cherenkov telescope looks for Cherenkov radiation. By recording the light from the cascading particles with extremely high-speed cameras, the telescope can identify the direction and intensity of the gamma rays, and then construct an image of whatever emitted the radiation. H.E.S.S II joins four smaller cherenkov telescopes, and boosts the capabilities of the observatory enormously. Even though the entire structure weighs more than 500 tonnes, and supports a 3 tonne camera some 36 meters away from the mirror, it can still slew around to point at transient events more than twice as fast as the smaller, older scopes. The telescope was jointly designed by South African and German engineers, and construction was shared between Namibia and Germany.